Meredith Snider’s latest exhibition, Still Life: Bouquet at Central Art Garage (September 11 – October 16, 2015) is a beautiful examination of the interrelationships of sculpture and photography, the social act of expressing an apology through a bouquet of flowers, and the notion of the absurd. Typically I don’t work (conceptually) from within my own home, however I had just moved into this house in Hull that was built in 1895 and I felt a strong sense of character and history seeping out of the walls. It did not feel like ‘my home’ so much as ‘a home’ and I felt intrigued to work within its confines while taking into consideration its characteristics and the effects it had on my emotions and behavior. The digital image, Untitled, 2015 that I used to promote the exhibition captures the atmosphere of the house in relationship to the sculpture. In the picture above, one can definitely see the connections between the house’s mouldings and the sculpture framed within the doorway. With this in mind, the connection between the photograph within Snider’s house and the sculpture can imply connotations of gendered space and acts. My partner brought home a bouquet of fake flowers one day that his client no longer wanted. She asked him to pass the flowers on to me assuming I would want them to decorate my home. 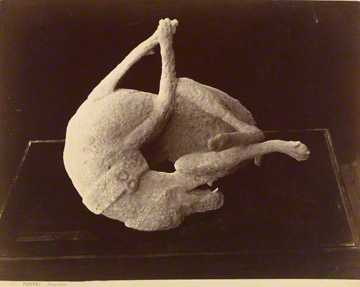 At the time I was in the midst of preparing a still life photography workshop for seniors and had come across the image of Cast of a Dog Killed by the Eruption of Mount Vesuvius, Pompeii, about 1874, by Giorgio Sommer. I was, and still am, very intrigued and moved by this image. For one thing, it is a sculptural object that I came across in a book on still life photography and was therefore interesting as it related to my research on sculpture and photography (as well as the use of plaster). The object references a significant historical event while its materiality and posture indicate life and death, movement and stillness. All this to say that when I received the flowers, I had the urge to further ‘still’ what was already a plasticized version of something living, to encapsulate its form. It felt like an ‘inside joke’ as the term <em>Still Life: Bouquet</em> kept circling my mind… From this starting point I continued to take into consideration the routine use of bouquets as decoration and as gesture from within a domestic environment that has the characteristics of age and solitude. Snider also conducted extensive research into the history of sculpture and photography while she worked on these artworks. For example, she looked at Heinrich Wolfflin’s 1896 essay “How Should One Photograph Sculpture” details (in a very passionate way) some of the best ways to photograph sculpture in the late-1800s, Rodin’s photographer shooting his sculpture in moonlight, or simply photographing a close up element of a sculpture, like an armpit. Snider plays and engages with all of these ideas one way or another in the photographs she took of her work. She photographs them close-up with coloured light highlighting the unusual landscapes found within the Untitled (from the series Sculpture & Photography). Overall, the exhibition has an absurd kind of humor that explores the custom of giving of flowers. The exhibition questions why we give apologies, where did the custom of giving flowers come from, and how it is a gendered act. You can catch Still Life: Bouquet at Central Art Garage until October 16th, 2015.